In case you are a lazy bum and coffee lover at the same time, you probably have a coffee machine on the kitchen, or am I wrong and you always go out for the coffee break? 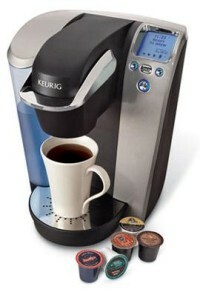 If you got one at home, is it as good as the Keurig B70 Gourmet Single-Cup Home Brewing System? Yes, the name of this coffee machine is very big, but so is its quality or so it seems. How it works (part 1): perfect for the lazy bums, just insert a cup – actually called K-Cup – that contains the coffee of your choice, and the Keurig does the rest in a matter of 40 seconds, afterwards there should be a cup of coffee waiting to get demolished by you. How it works (part 2): No, it doesn’t require AAA batteries. Just plug it into the AC outlet and you are good to go. How many coffee variations there are: the machine includes 18 different K-Cups, but there are more than 100 different coffees and teas. This is the perfect part for the caffeine lovers, you will get the chance to experiment tastes you never knew they existed. Overall, which one is the best feature: it is clear that the shiny LCD is the center of attractions. It has a blue blackligt and displays all the information you need to have the best morning (or nightly) coffee ever. On second place we have the adjustable water temperature, a good one for people that don’t like a really hot coffee. This Home System for coffee lovers costs $200 at SharperImage!